The speed for the connection of the video might be slow. The mandarin voiceover can be briefly translated as follows. It is about a little hero named Lin Hao who is only 9 years old. When the earthquake happened, he was in the school with other 30 students. Only about 10 students escaped from the building. The little boy, who had escaped, went back to pulled out two other pupils and carried them to safety. Now he is in Dujiangyan with his sister and we see no panic in his eyes. But till now he hasn’t found his parents yet. Wish good luck with him and wish he would find his mom and dad in the end. Posted in Photos and Videos, Stories | 8 Comments » | Read more..
“Have you by any chance found that lovely, studious girl called Qingqing?” At the rescue scene, Quanhong Chen, the class instructor of Unit One in Grade One of Rong Hua Town Junior Middle School kept asking, as she knew, Qingqing, though coming from a poverty stricken family, was blessed with lofty aspirations, and often immersed herself in reading under torchlight on her way home after school. 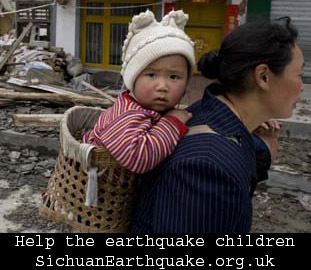 In another scenario similar to that of Qingqing Deng, a girl called Yao Luo, had her hands and legs both injured during the earthquake. While being buried under the ruins, she was humming and singing the “Piano Dreams” unceasingly in an effort to keep herself stay awake. these efforts not only kept her alert, but also, in the end, rewarded her with the triumph over death. Posted in Stories | No Comments » | Read more.. When the rescue team found her, she was already dead, crushed by the collapsing building. Through the gap of a pile of rubble, the resucers saw her in a strang kneeing position, upper body bending forward, two arms stretching to support the body, as if in an ancient ceremony. The rescuers shouted toward the debris, tapped on the bricks. No response. They moved on. After while they managed to remove the rubble on top of her. Underneatch her chest, protected by her arms and legs, was this baby, wrapped in a red quilt with yellow flower spots, only 3 or 4 months old, sleeping, uninjuried. The doctor, who had seen too many terrible things in the last few days, bursted into tears. The phone was carefully passed around the rescuers, when the tears flow. Posted in News, Photos and Videos | 2 Comments » | Read more..